Entrance to Emberley exhibition. Image reproduced with permission from Worcester Art Museum. A comprehensive exhibition for award-winning children’s picture book author and illustrator Ed Emberley opened November 16 at the Worcester Art Museum (WAM) in Massachusetts that examines Emberley’s enduring 60-year influence on budding artists and authors. Over 100 artworks from Emberley’s own archive are on display--woodblocks, hand-drawn mock-ups, even a 90” by 30” print of Paul Bunyan--along with another 100 books written and illustrated by the prolific author. The career of the 85-year old Massachusetts native began in 1962 when The Wing on a Flea: A Book About Shapes made that year’s New York Times top-10 list of illustrated books. Since then, Emberley has create books stylistically diverse and endlessly creative, with some seeing greater commercial success than others, and many achieving beloved, almost cult-like following. For example, the 1975 out-of-print The Wizard of Op remains a coveted item by collectors, available online at a base price of $50 in acceptable condition. Prices rise to over $200 for copies in mint condition. Paul Bunyan’s Bunk House with plenty of space to cozy up and read. Reproduced with permission from Worcester Art Museum. Why host a retrospective now? Guest curator and fellow artist Caleb Neelon collaborated on a book about Emberley in 2014 with designer Todd Oldham (Ed Emberley/AMMO Books) and has been nursing the idea for a full-scale examination since then. “Putting together a show has been in the back of my mind since our book came out, and it turned out Adam Rozan [Director of Audience Engagement at WAM] and I were on the same page,” Neelon said. A comprehensive exhibition for award-winning children's picture book author and illustrator Ed Emberley opened November 16 at the Worcester Art Museum (WAM) in Massachusetts that examines Emberley's enduring 60-year influence on budding artists and authors. 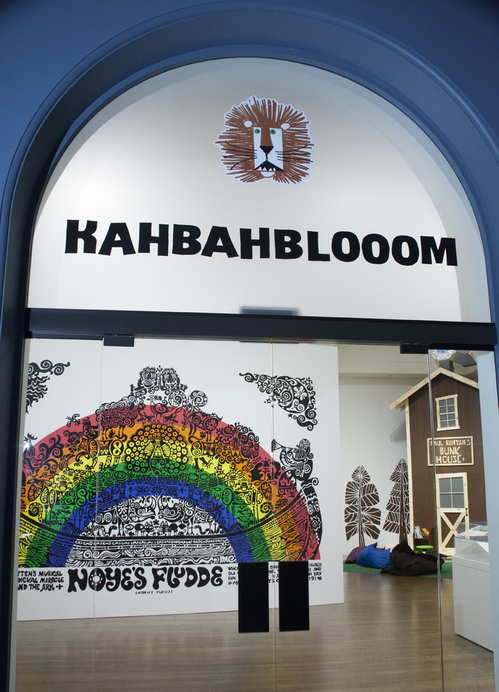 Over 100 artworks from Emberley's own archive are on display--woodblocks, hand-drawn mock-ups, even a 90" by 30" print of Paul Bunyan--along with another 100 books written and illustrated by the prolific author. The career of the 85-year old Massachusetts native began in 1962 when The Wing on a Flea: A Book About Shapes made that year's New York Times top-10 list of illustrated books. Since then, Emberley has create books stylistically diverse and endlessly creative, with some seeing greater commercial success than others, and many achieving beloved, almost cult-like following. For example, the 1975 out-of-print The Wizard of Op remains a coveted item by collectors, available online at a base price of $50 in acceptable condition. Prices rise to over $200 for copies in mint condition. 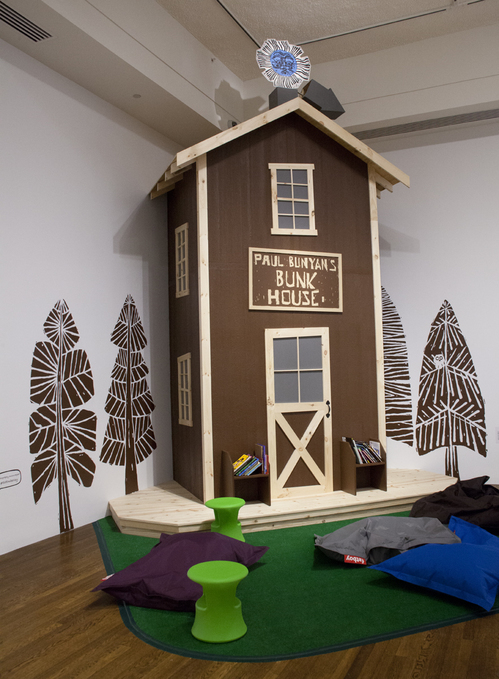 Paul Bunyan's Bunk House with plenty of space to cozy up and read. Reproduced with permission from Worcester Art Museum. Why host a retrospective now? Guest curator and fellow artist Caleb Neelon collaborated on a book about Emberley in 2014 with designer Todd Oldham (Ed Emberley/AMMO Books) and has been nursing the idea for a full-scale examination since then. "Putting together a show has been in the back of my mind since our book came out, and it turned out Adam Rozan [Director of Audience Engagement at WAM] and I were on the same page," Neelon said. "Emberley's books stand the test of time in that they teach you something--whether you're the kid or the grownup with the kid, you learn how to draw a simple lion or something else, and you feel good because you did it, and you can do it again, returning to that good feeling," Neelon continued. "Ed's whole goal is to get kids to look at something and say, 'I can do that!' When children turn seven or eight, some start to feel self-conscious about their drawing abilities and many stop drawing. These books take kids through that awkward stage and lets them have fun while they're at it." "We hope our visitors will appreciate that Ed Emberley is an artist that must be seen and shown in art museums," reiterated WAM's Rozan. "His is the work that will be viewed in institutions now and in the future. Emberley's work reminds us to innovate, dream, and wonder about the importance of the visual image and its relationship to the written word." "There are a lot of sad moods flying around our world right now," concluded Neelon. "This is a good show to see if you are feeling low and need a lift."